We are pleased to announce that the catalogue for our small collection of Papers belonging to David and Emily Lorimer is now available on Archives Hub. The Papers we hold came from two different sources and were given to the Society at different moments in its history and so the Papers have been divided into two Series – the Lorimer-Gilgit Papers and the Lorimer-Carter Papers. These are titles that had previously been assigned to the Papers and since they are descriptive of the material contained under them, it was decided to keep these headings when cataloguing. David Lockhart Robertson Lorimer was born on 24 December 1876. He entered the Indian Army in 1896. From 1898-1903 he served with the Q.V.O. Corps of Guides, and was seconded with the Khalibar Rifles from 1901-1903. He entered the Indian Political Service in 1903, serving with them until 1924. His posts included H.B.M.S. Vice-Consul for Arabistan (1903-1909); Political Agent, Bahrein (1911-1912); H.M. Consul, Kerman and Persian Baluchistan, and ex-officio Assistant to the Political Resident, Persian Gulf (1912-1914); Assistant Political Agent, Chitral (1915); on field service with the I.E.F.D., Mesopotamia, and Civil Governor Am’ra (1915-1916); H.M. Consul Kerman and Persian Baluchistan (1916-1917); Political Agent, Loralai, Baluchistan (1920), and Political Agent, Gilgit (1920-1924). Lorimer was awarded a Leverhulme Research Fellowship, 1933-1935. He also received an honorary fellowship of the School of Oriental and African Studies, University of London, in 1953. He died in 1962. Emily Overend Lorimer (1881-1949) was a British linguist, political analyst and author, She was a tutor in Germanic Philology at Somerville College Oxford, 1907-10, and editor of ‘Basrah Times’ 1916-17. She was with her husband, David Lockhart Robertson Lorimer, British resident in Cairo during the First World War and its Arab Revolt. She was an early translator and analyst of Nazi works, including Adolf Hitler’s Mein Kampf in the 1920s and 1930s. She worked with her husband on Asian studies. 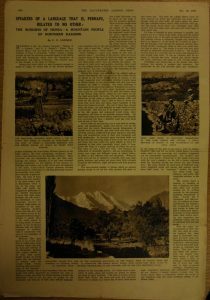 The Papers within the Lorimer-Gilgit series relate to the Lorimers’ trip to Gilgit in 1934-1935 . They were given by Sidney Duly to Richard Pankhurst, Royal Asiatic Society Librarian, in February 1981. Duly, author of “The Natural Wealth of Britain, Its Origin and Exploitation”, was a friend of the Lorimers and the papers include correspondence from them to Duly. Letter from David Lockhart Robertson Lorimer to Sidney John Duly in which he writes of his journey to Bombay and that they hope to be in Gilgit by June. Sent from Srinagar, India, Handwritten letter, 3 pieces, 6 sides, dated 13 May 1934. There are also articles written by the Lorimers including “The Burusho of Hunza – a Mountain People of Northern Kashmir”. 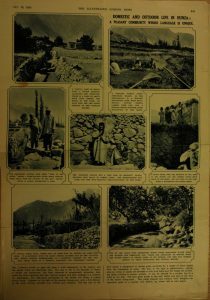 This is an illustrated article with accompanying photo-articles, “The Crafts and Husbandry of the Burusho: A Mountain People in the “Apex” of India”, and “Domestic and Outdoor Life in Hunza: A Peasant Community whose Language is Unique” by Emily Overend Lorimer which were printed in The Illustrated London News, 19 October, 1935. There are also a couple of manuscripts including “Report on Expedition to Gilgit and Hunza, India, by Lt. Col. and Mrs. D.L. R. Lorimer, 1934-1935”. This is a typed manuscript with handwritten annotations concerning their itinerary and the discoveries they made on their trip to Gilgit. It is dated on the final page as 7 January 1936. The Papers in the Lorimer-Carter Series came into the Society in 1967 when Roland Carter sent them to Miss Nielsen. 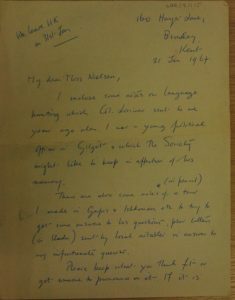 Letter from Roland Carter to Miss Nielsen, Royal Asiatic Society, to enclose some notes on language hunting by Col. Lorimer. 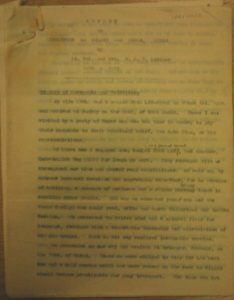 Handwritten, 2 sides, dated 21 January 1967. 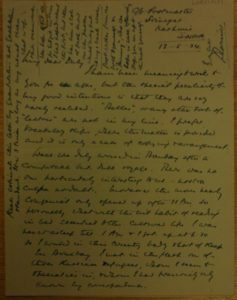 As the letter explains he enclosed some notes on language hunting which Col. Lorimer had sent him as a young political officer in Gilgit, and some further notes that Carter had made of a tour in Gupis & Ishkoman. And the series containsf correspondence from David Lorimer to Carter and also information from the investigation that Carter undertook to aid Lorimer’s research. 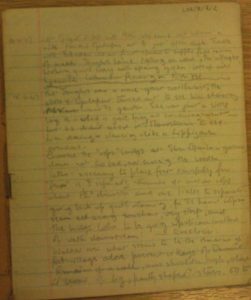 Diary of a tour from Gilgit – daily notes made of a trip leaving Gilgit on 14 April 1947. Entries continue until 29 April 1947. Soft light brown cover notebook with ruled pages. The Lorimers made an important contribution in the understanding of the people and language of the Gilgit region. Most of their archival material was bequeathed to SOAS but maybe our small Collection may also add to the picture of this interesting couple.